One of the realities of marriage is that you have to make a lot of decisions together. 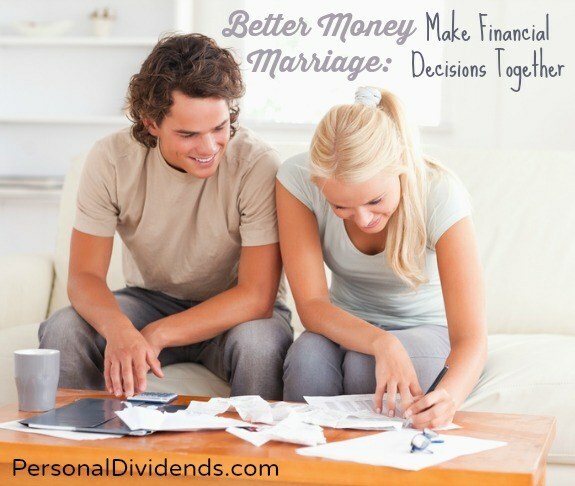 And, interestingly, you can be happier in your marriage if you take the time to make financial decisions together. Since money is a major source of stress in many relationships, tackling your decisions together can make a difference, at least according to some research reported by U.S. News & World Report. No one likes handling money on their own. Investing and other types of financial decisions can be stressful and often come with a hefty dose of responsibility. Handling it solo can be stressful. That’s why couples usually report that they prefer to share jobs and are more satisfied when they tackle decisions together. You can address your individual and shared money issues, and make sure that you are both on the same page. Making decisions together can strengthen your relationship. This includes money decisions. You can feel more satisfied as you work on shared goals, and make progress together. This, again, builds bonds. I know that I feel closer to my husband when we are working together. Even if you keep some aspects of your finances separate, rather than combining everything, the reality is that you should have some shared goals. If you aren’t sharing something, why are you even married? Shared goals, like buying a house together, planning vacations, or spending money on your children, can help draw you together. And they force you to talk about your finances together at least some of the time. This can help your marriage, as well as your household finances. You can connect on a personal level, and get used to working together for common goals and experiences. These are the things that help people bond — and remain bonded — during life. While my husband and I have combined finances, I know that this doesn’t work for everyone. The “big pot” method isn’t for everyone. However, it appears that it is still important for you to have some combined financial goals, and that means making some decisions together. You’ll be happier with the decisions (sometimes it’s easier to feel comfortable with your choices when you’ve been able to talk them over and share responsibility with someone else), and you might also be happier in your marriage. What do you think? Do you have shared financial goals with your partner? What do you talk about? How do you handle money decisions?